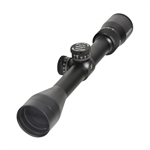 Featured with all SIII Series Riflescopes. ALlows for quick and easy adjustments wen in the field. Diopter adjustment ranges from -2.0 to +1.0 settings.